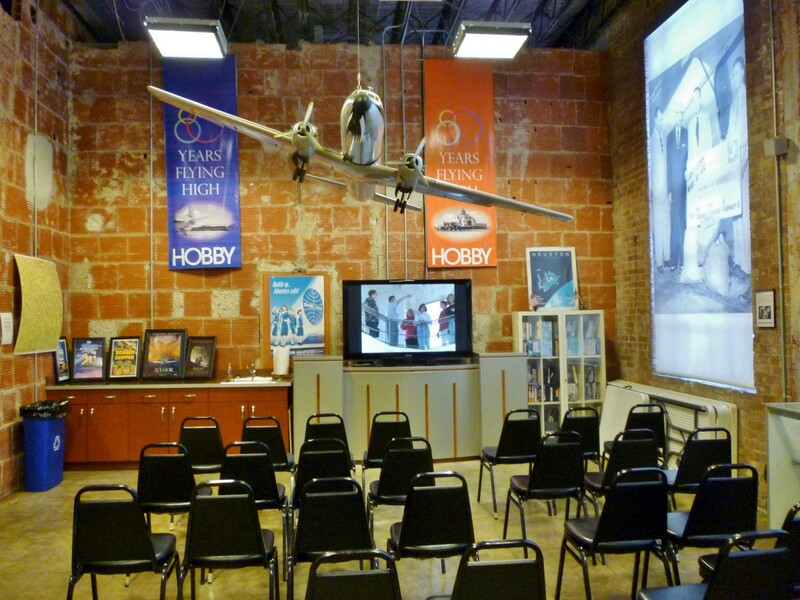 The 1940 Air Terminal Museum at Hobby Airport in Houston is a must-see venue for people interested in civil aviation history. This facility was the first Houston municipal airport terminal to welcome people from around the world. 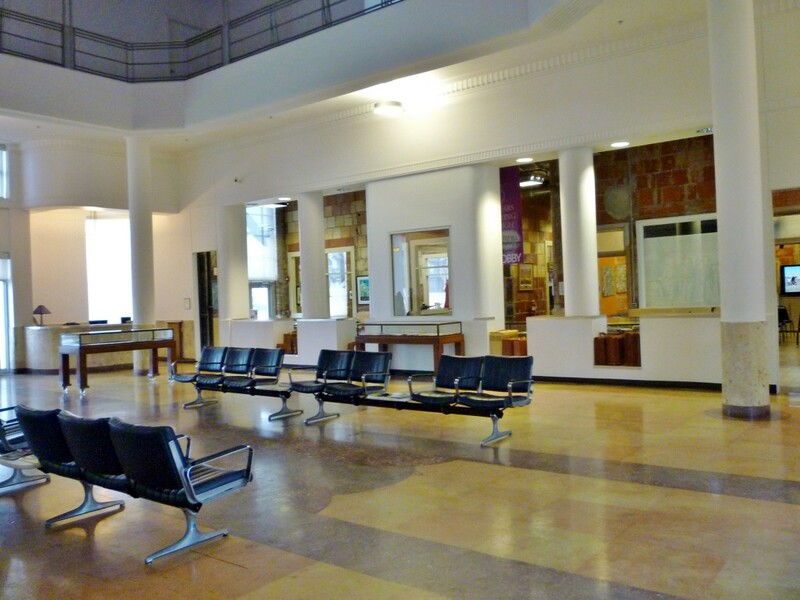 The modernist Art Deco style of the building is another reason to pay a visit. Joseph Finger designed this building, as well as others in Houston. 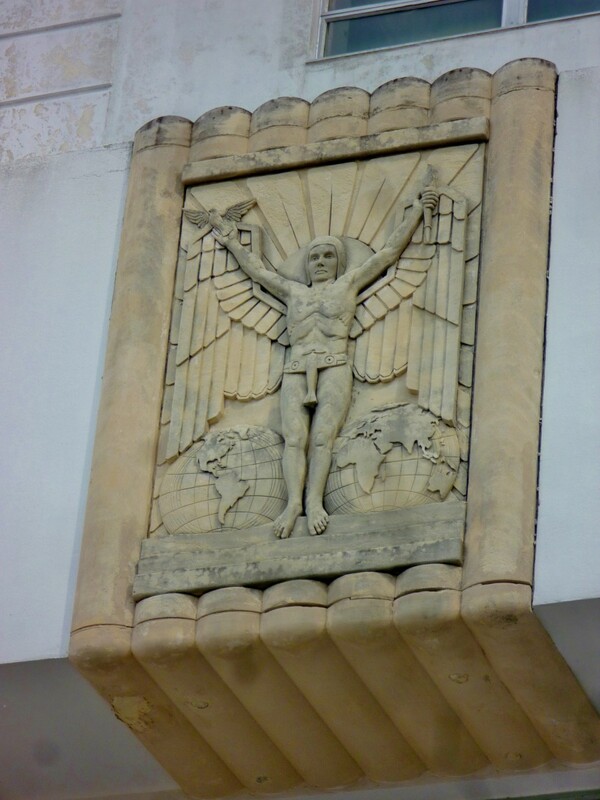 His works were noted for their distinctive Art Deco architectural styles. Our City Hall in downtown Houston is one example. 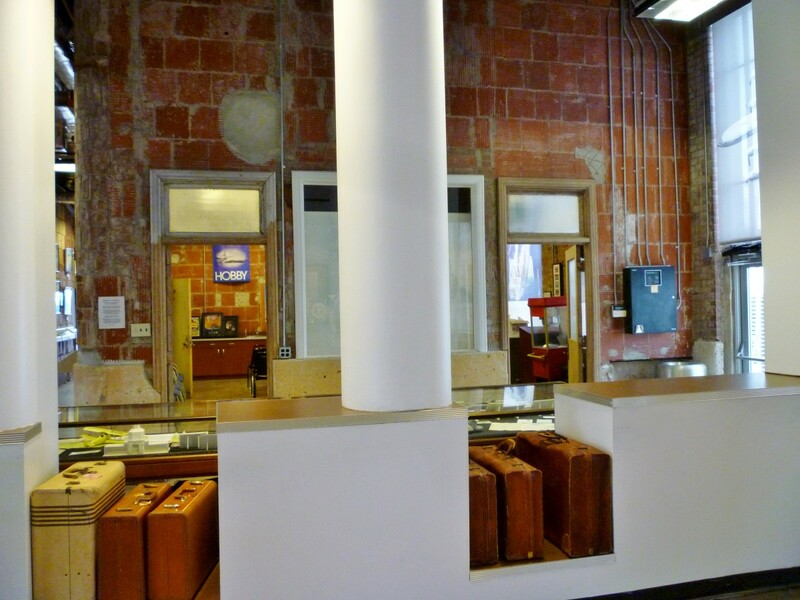 The 1940 Air Terminal Museum stands in testament to the glamorous days of early flight. People traveling by air used to dress up in their finest clothing. Stewardesses used to serve meals on china plates to the passengers. 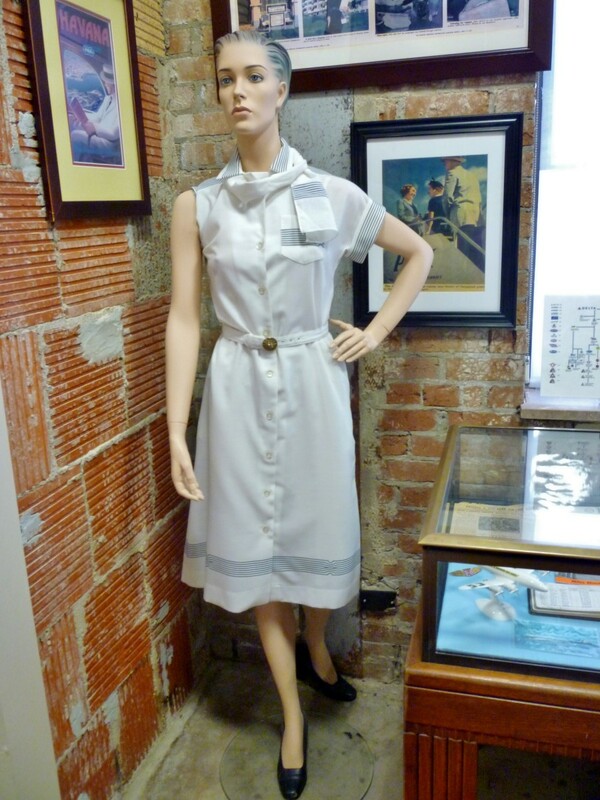 There is a nice example of some of the uniforms worn by stewardesses in bygone days. Of course, people serving in that capacity are now called flight attendants. 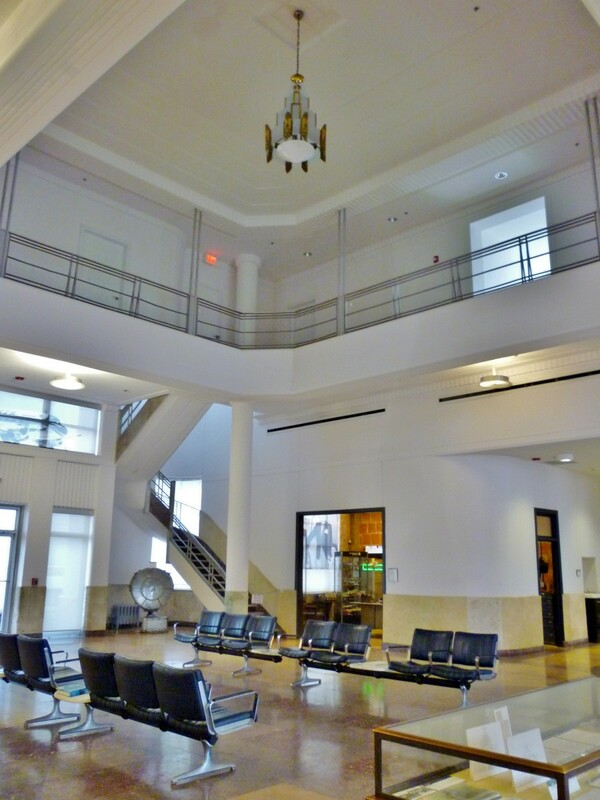 Below is a video showing the terminal before the Houston Aeronautical Heritage Society decided to take on a massive restoration project of this historic building. Before my husband and I even entered this museum we took a look at the airplanes parked outside. A little Cessna 310 was parked nearest the building with a Hawker Siddeley HS-125 business jet in the forefront of this photo shown below. Every third Saturday from 11 am to 3 pm, aficionados of older aircraft and classic cars like attending the Wings and Wheels event. 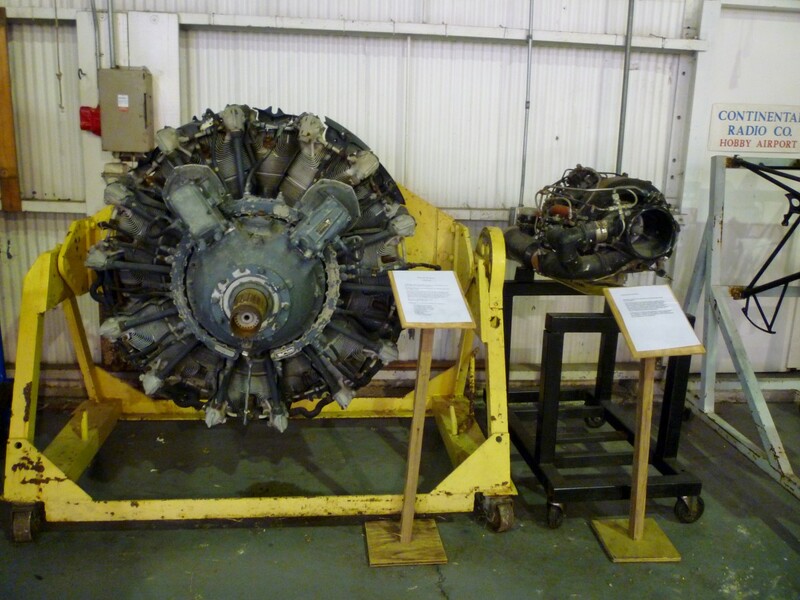 Aircraft tours are given as well as museum tours all for one ticket price. Food is available on site. 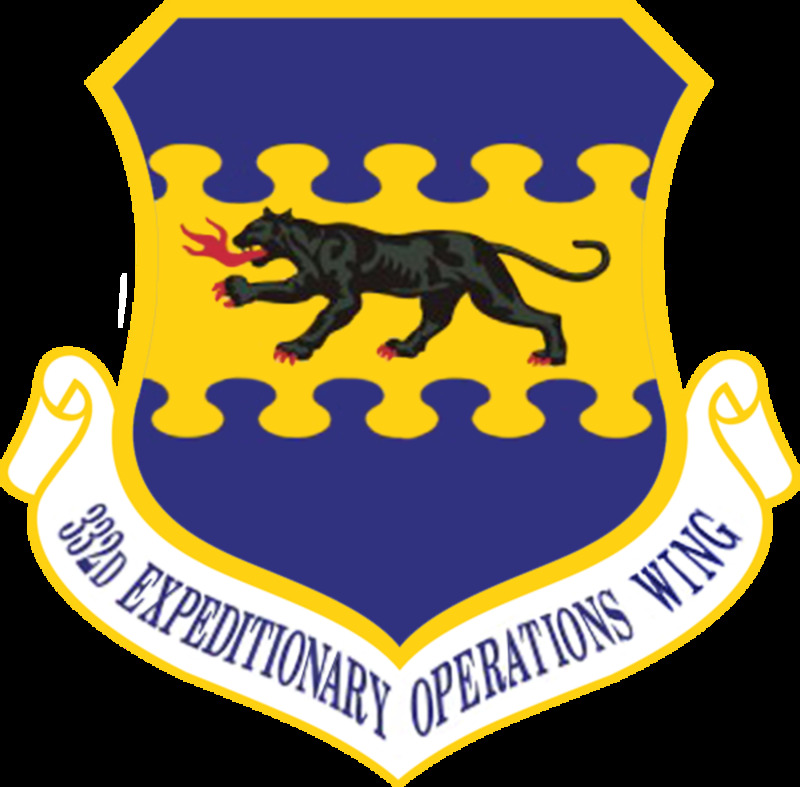 Click on the highlighted link of Wings and Wheels to learn more. Below is a video of one such weekend. 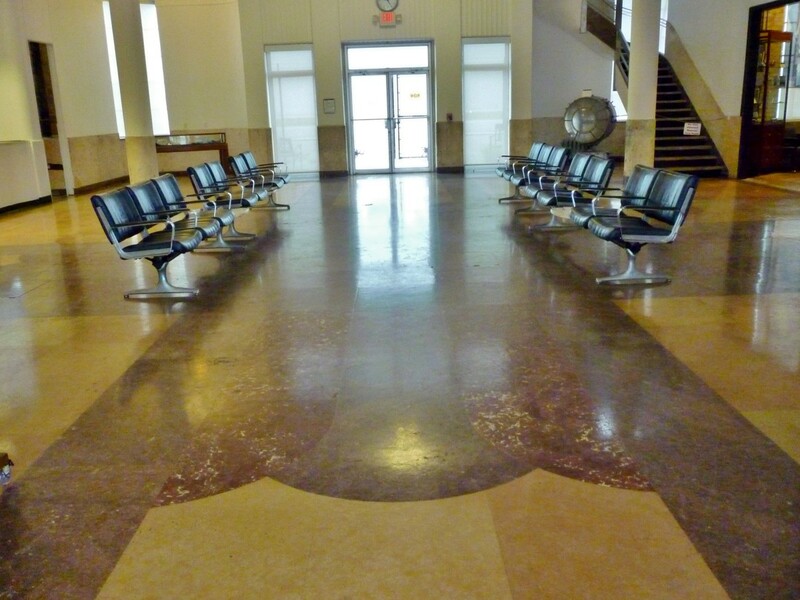 Beautiful marble flooring is immediately seen when entering the doors into the open spaced atrium of this multi storied building. 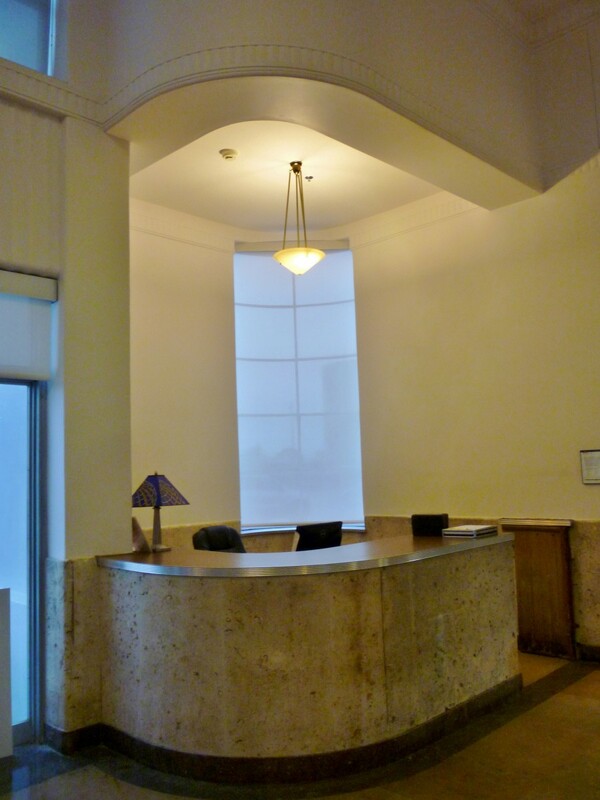 My photos show different angles taken of this same atrium lobby. Notice the Art Deco chandelier hanging from the ceiling above. It is original to the building. At the present time all of the displays are located on the first floor. Upper floor restorations will take place as monies are raised for multiple purposes. 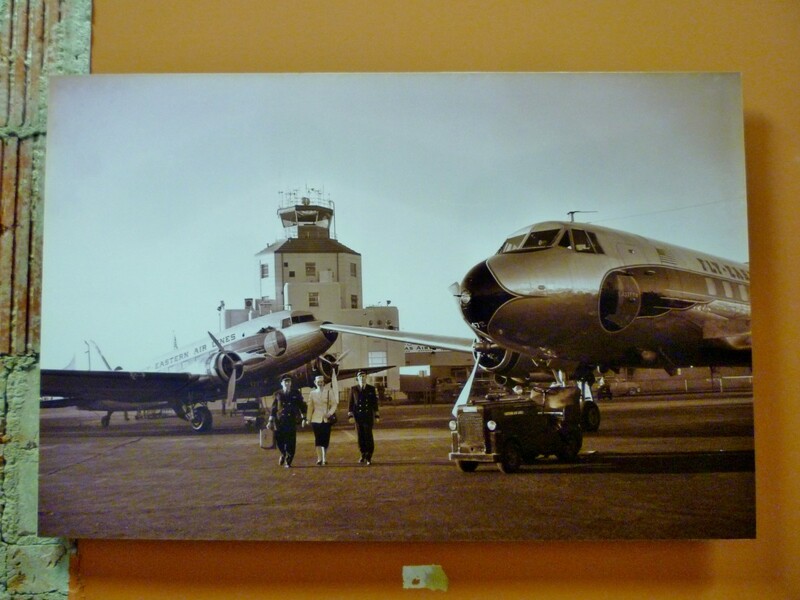 Braniff and Eastern Airlines were the first two major airliners based at this terminal. 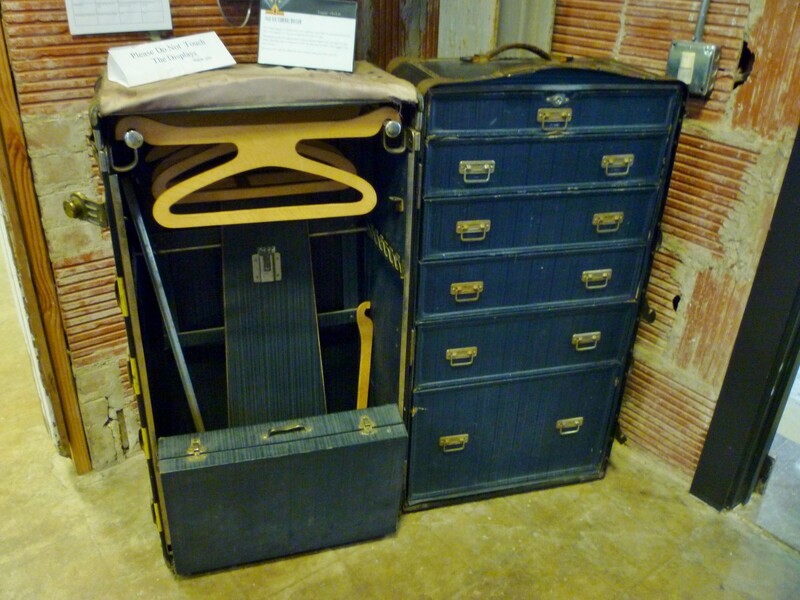 One such example of how fund raising can help the museum is demonstrated in the video below. 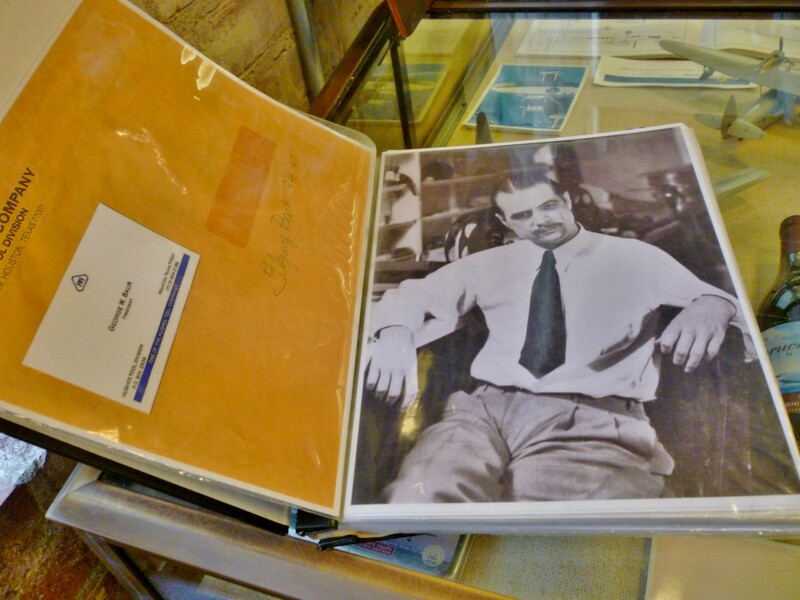 Howard Hughes—famed aviator and entrepreneur—had his own hangar at Hobby Airport. 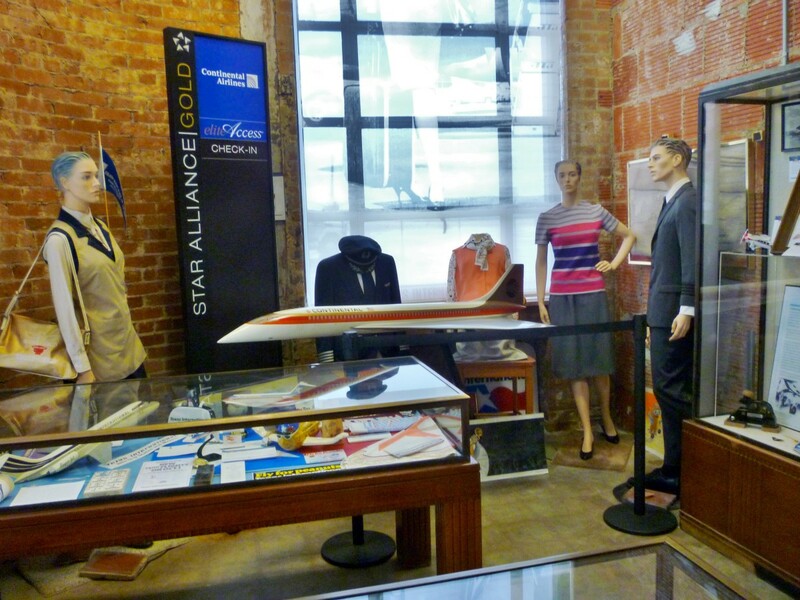 There are many photos of him and his airplanes as a part of the extensive memorabilia inside this museum. An interesting letter signed by Howard Hughes to Cordell Hull who was Secretary of State back in 1939 was on display. He was thanking the state department personnel for the planned sub-stratosphere flight from New York to Paris upon which he would have flown. It never happened because of the “international situation” which prevented it at the time. 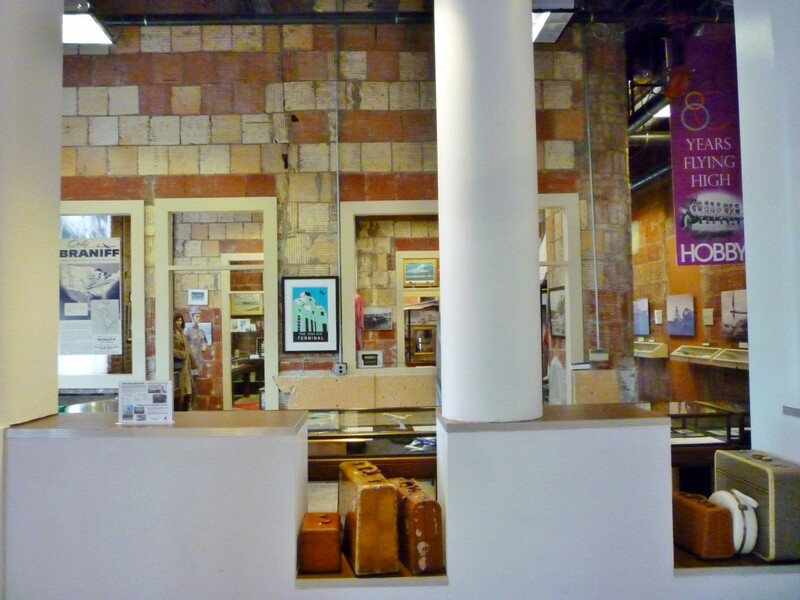 There is so much of history on display inside this 1940 Air Terminal Museum. In the first photo below, an agent is standing behind the Eastern Airlines counter waiting to check in passengers and baggage. 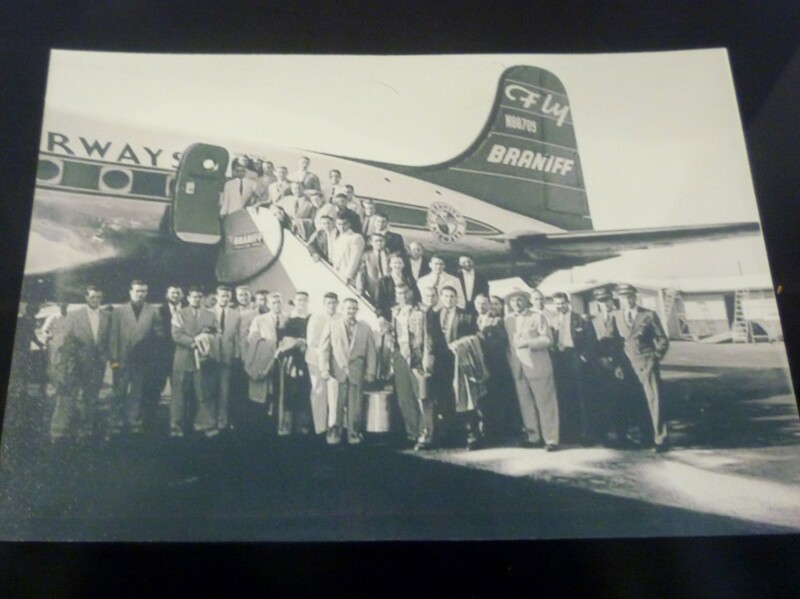 Humphrey Bogart is seated on the left waiting for his flight. This quote, in addition to the earlier one by Da Vinci, were on display inside the museum. There are multiple rooms on the first floor of this museum. 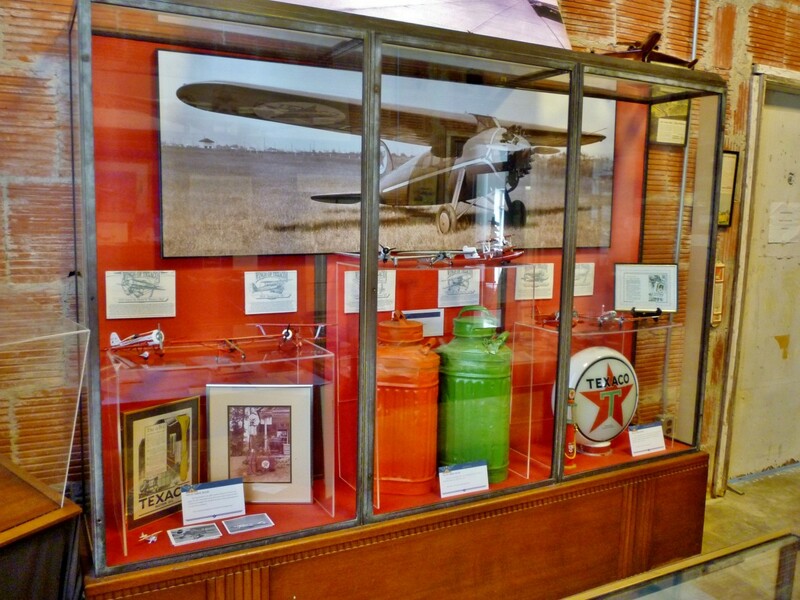 Numerous display cases hold many items of interest. What is now called Hobby Airport first originated in 1927. It was a general aviation airport called W.T. Carter Field and was privately owned. 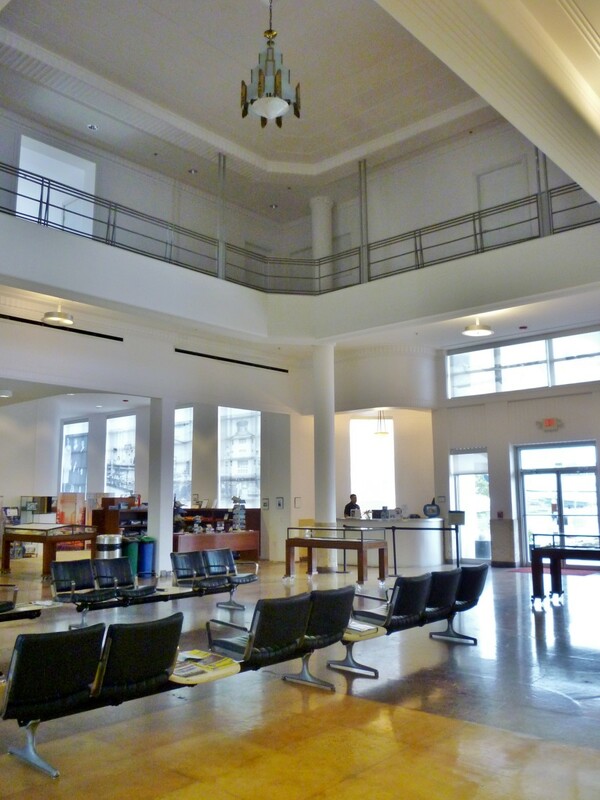 The City of Houston acquired it in 1937 and renamed it Houston Municipal Airport. For a brief period of time, it was renamed Howard R. Hughes Airport but that did not last long. 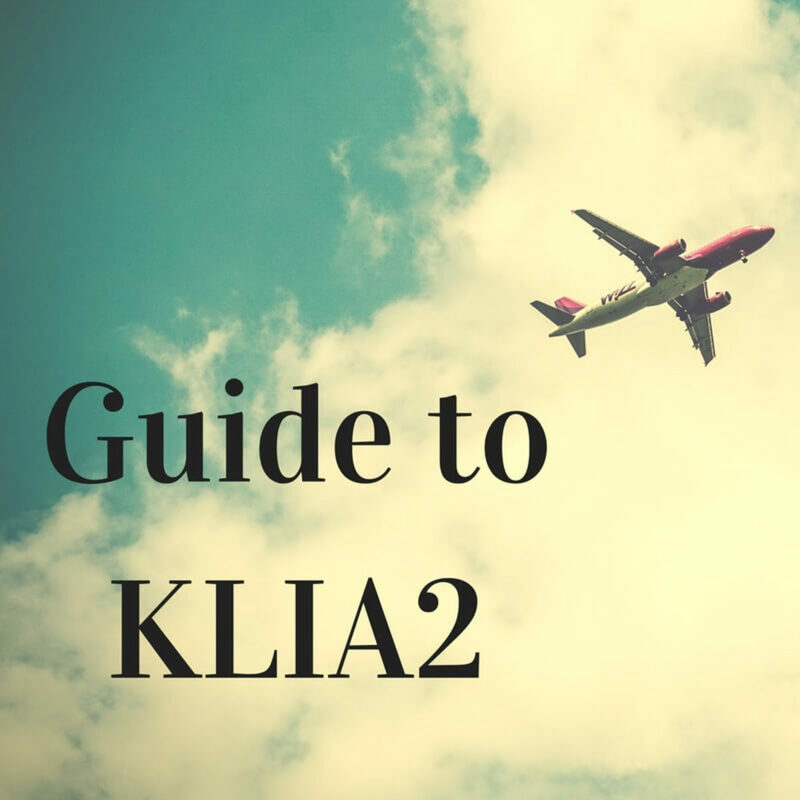 According to federal regulations at that time, an airport could not be named after a living person. It reverted back to Houston Municipal Airport. 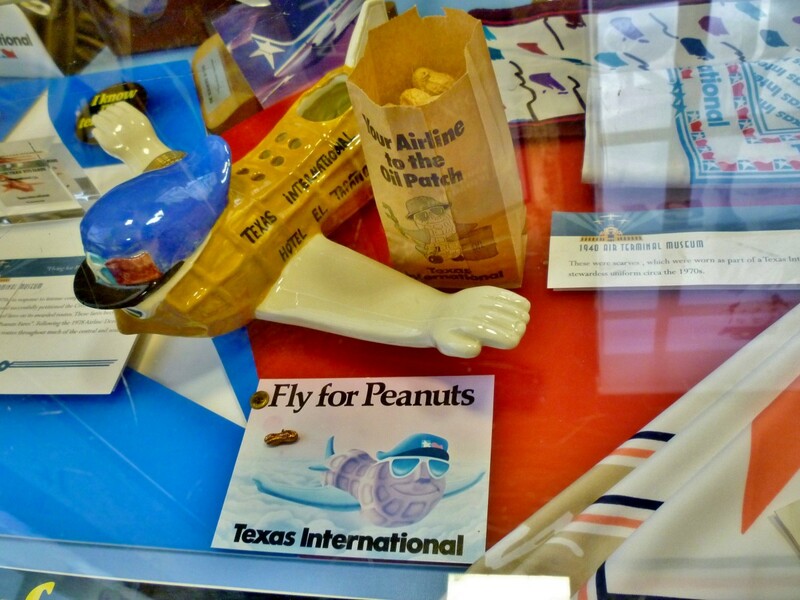 1954 was the year Houston International Airport became the new name. In 1967 3 years after the death of William P. Hobby who was the 27th governor for the State of Texas, the airport was renamed Hobby Airport. It still bears that name today. Obviously, that federal rule has been changed as our major airport on the north side of Houston is named the George Bush Intercontinental Airport. In earlier days of flight passengers were pampered. Playing cards were distributed free of charge and just about every airline had their brand emblazoned upon the cards which became souvenirs. According to information posted over 3,000 designs given out by more than 438 airlines are in existence. 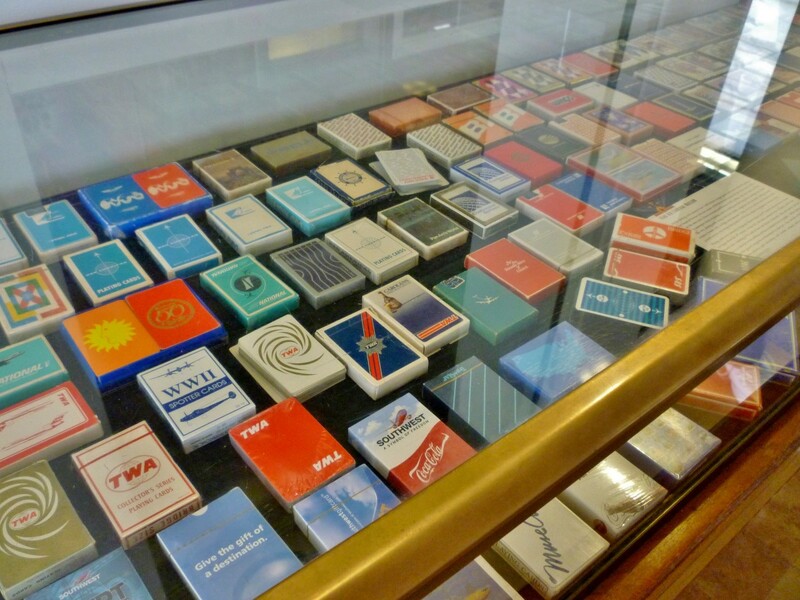 After airline deregulation took place in 1978 and due to subsequent cost cutting, airline playing cards are now a rarity. 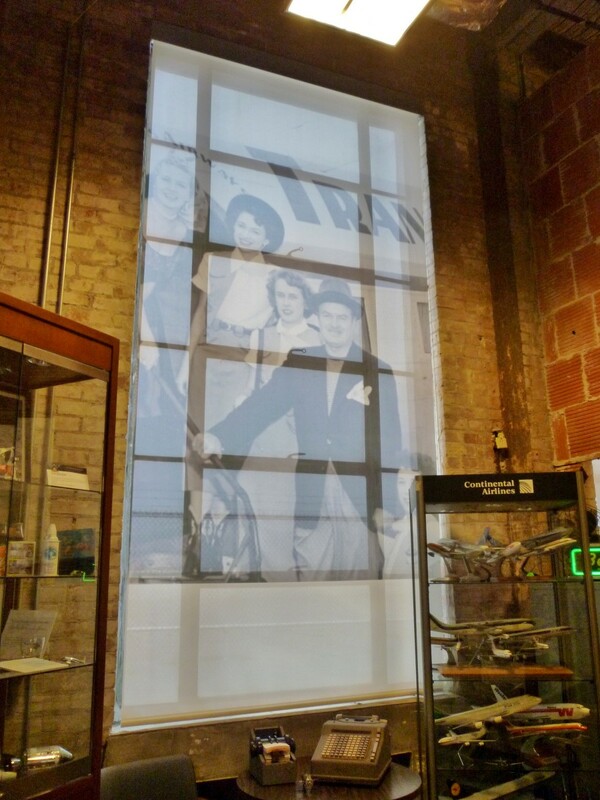 Translucent window coverings for many of the windows on the first floor of this air terminal museum have images imprinted from the past. 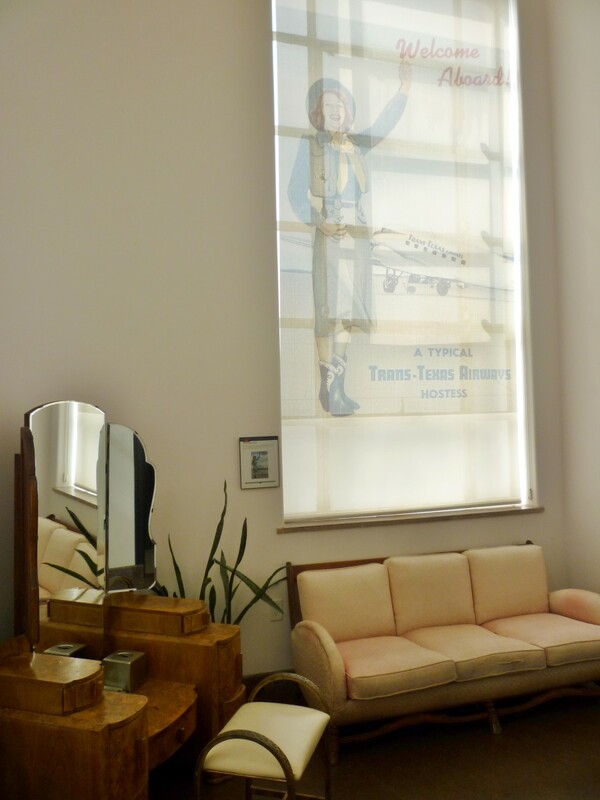 The image with the vintage sofa and dressing table is in the women’s restroom. 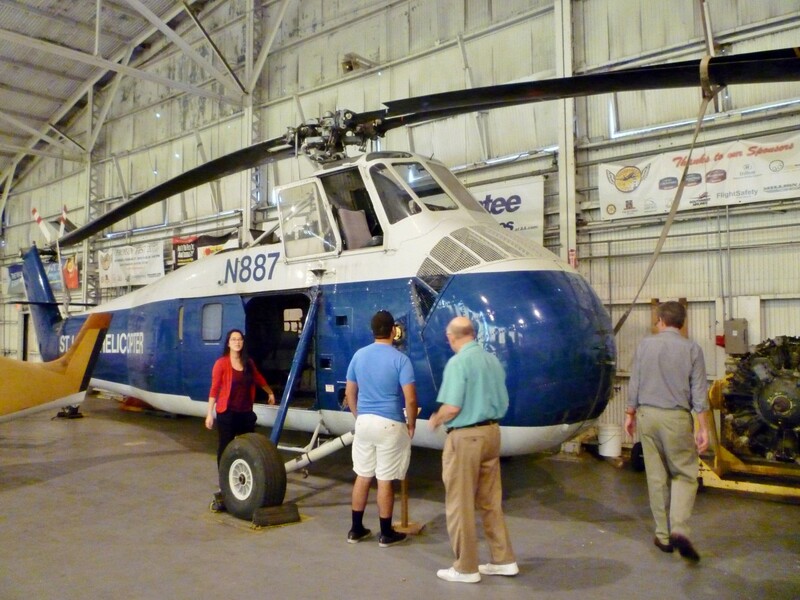 When enough people had come to the museum we were gathered as a group and invited to go to a nearby hangar where airplanes and more items related to bygone days of aviation are kept. It was interesting looking at the various displays. 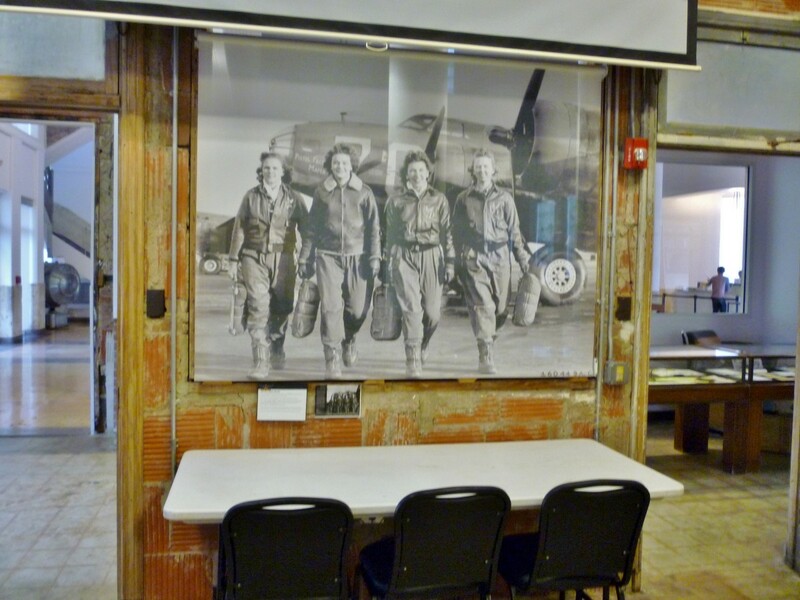 Many of the volunteers working at the 1940 Air Terminal Museum are also pilots. Therefore they seem to delight in answering people’s questions when touring this facility. 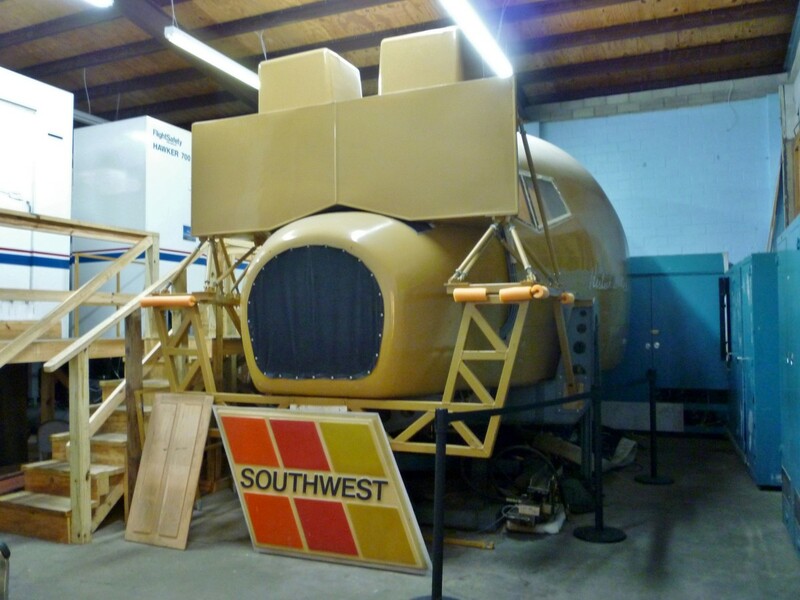 There is even an old flight simulator on display inside of this hangar. 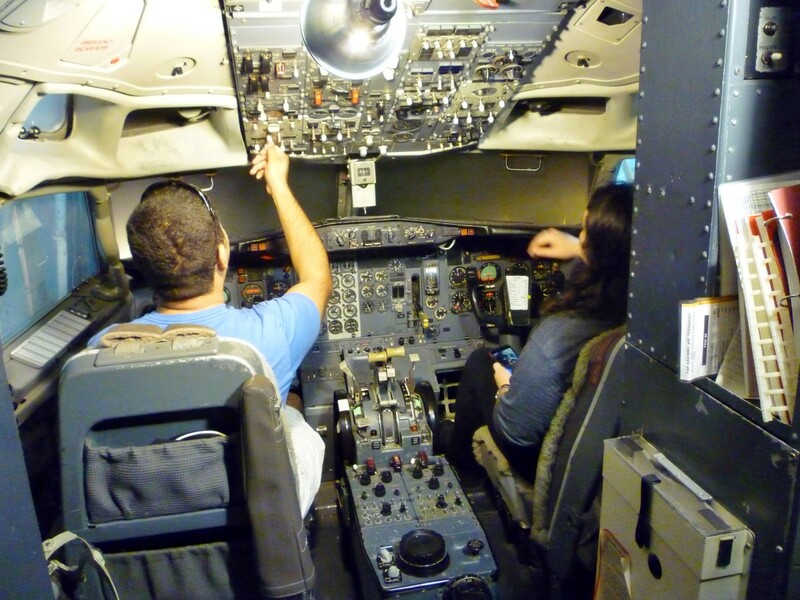 The two people pictured in the cockpit were not only visitors but are also pilots. 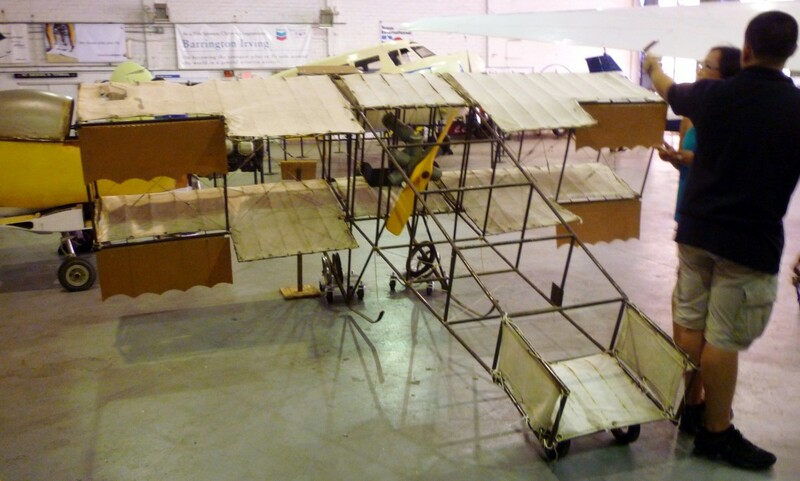 This is what was posted regarding the Henry Farman biplane including the 5/12 scale replica of the biplane pictured below. 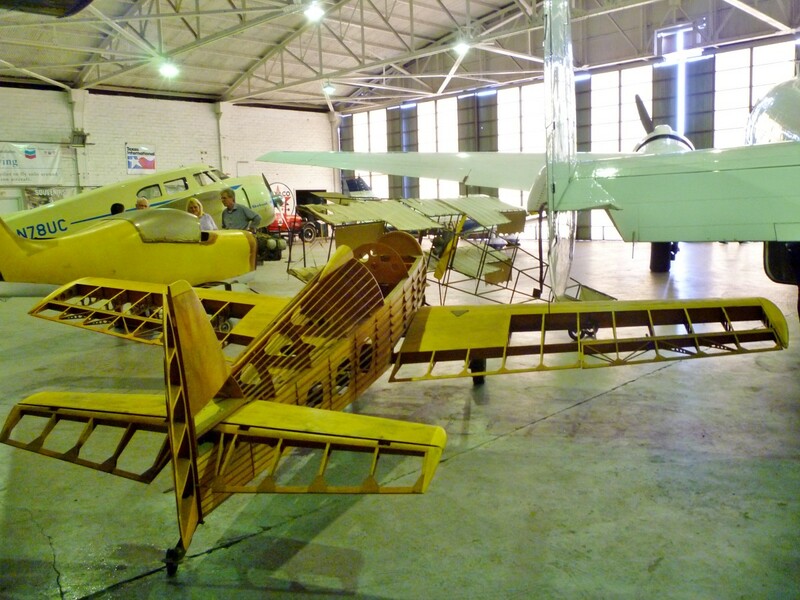 Each year an airplane is raffled off which is a major fundraiser for the museum. 2,500 tickets are sold at $50.00 each. At their July Wings & Wheels event the winner’s name is drawn from among the entries. Volunteer pilots fly this airplane and keep it in good operating order. This Piper Cherokee 1964 airplane was the one being auctioned off at the time of our visit to the museum. 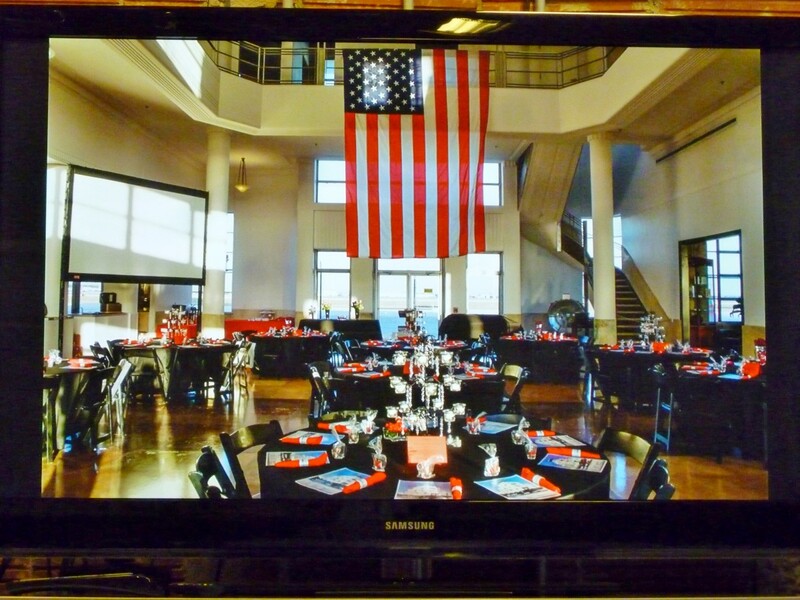 Private events can be held in the hangar as well as the atrium lobby and theater in the 1940 Air Terminal Museum. Prices range from $600 up to $7,500 depending upon the space selected. Watching the video below you now know that wedding guests could be wowed by the arrival of a bride and groom via this Cessna Bobcat airplane to the museum. As you can undoubtedly tell from my photos there is much to do and see at this museum. They have film nights, concerts and even dances here among other things. You can always keep up to date on their special offerings by checking their website. 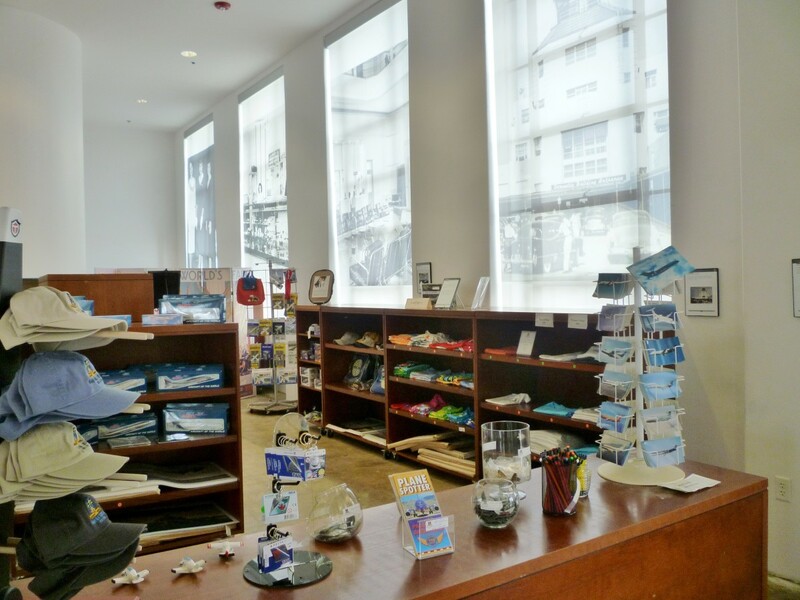 They have some wonderful offerings in their gift shop ranging from t-shirts to model airplanes and more. 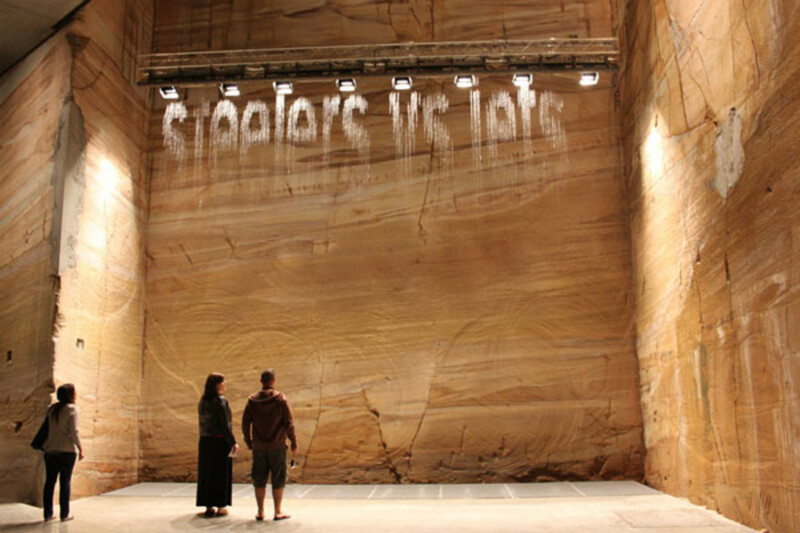 Would you believe that the admission charge for adults is only $5.00! Children under 12 are admitted for $2.00. That is quite a bargain! 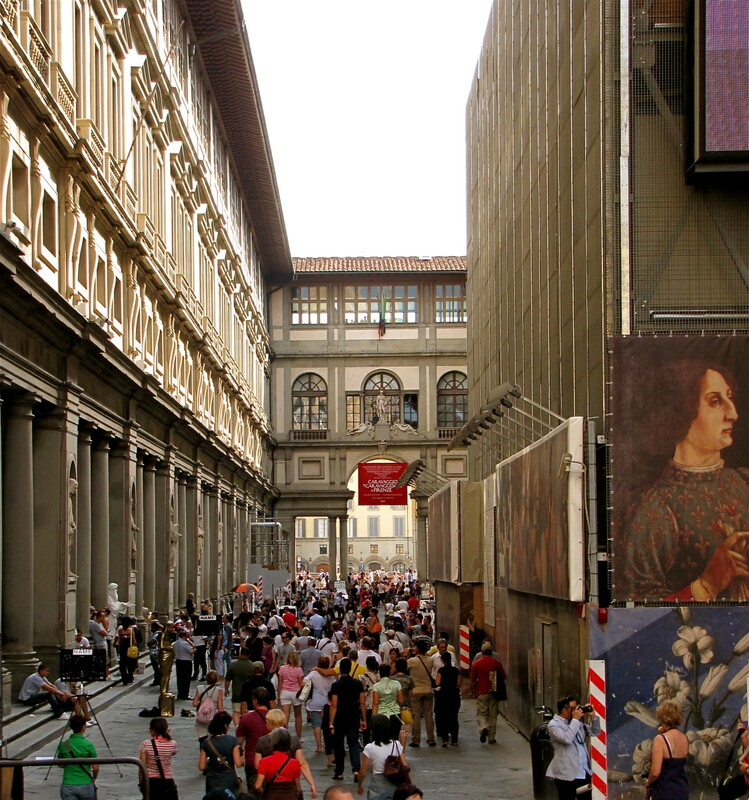 The charity organization operating and restoring this museum is definitely worth supporting. They are grateful for volunteers and always need more. 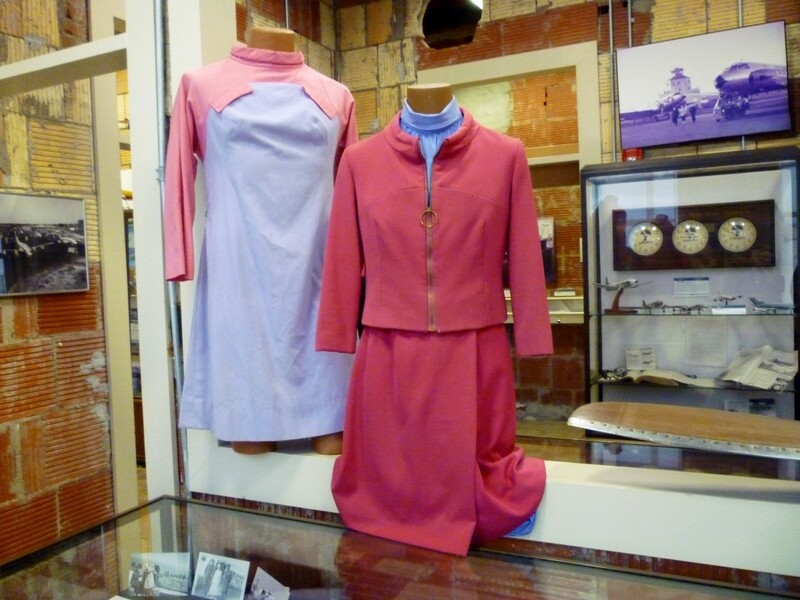 See a slideshow of the museum from 1940 to 2009 below. 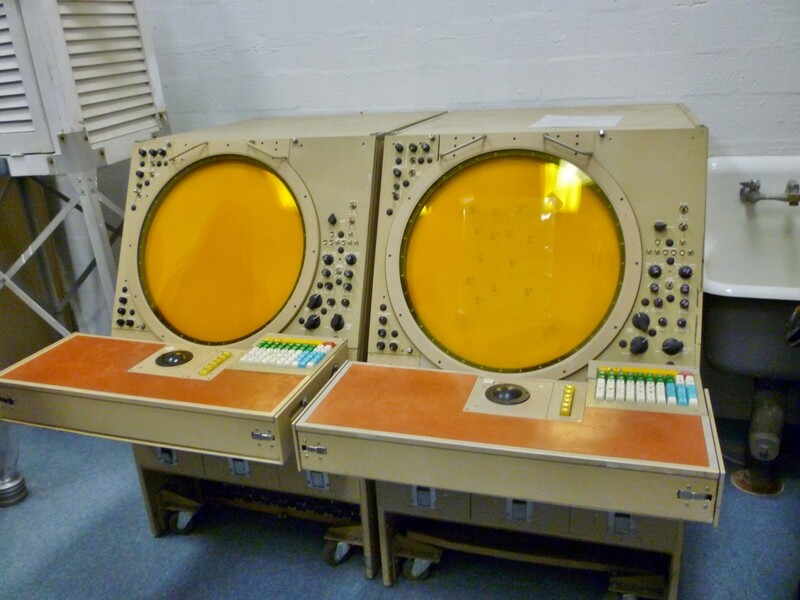 Would You Be Interested In Visiting This Houston 1940 Air Terminal Museum? Yes - I have visited it. I have not yet visited it but would be interested in doing so. 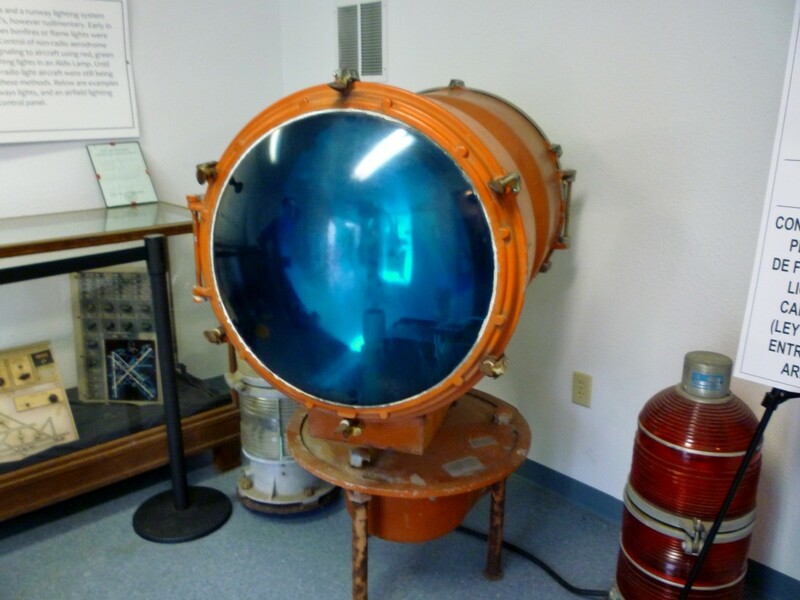 I will probably never get to see it in person but thanks for the virtual tour. I prefer visiting other sites instead. 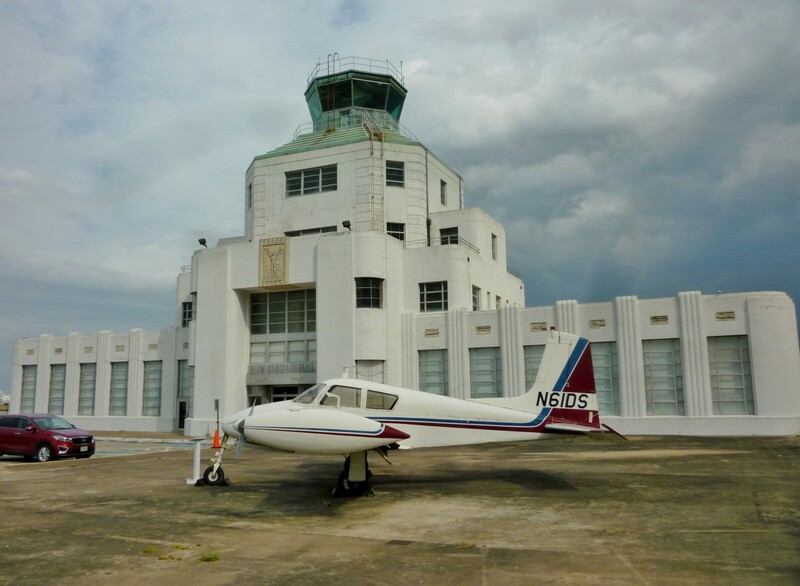 Since you apparently appreciate Art Deco Style, I know that you will find this 1940 Air Terminal Museum well worth a visit. Thanks for cluing me into this museum, which I hope to visit. 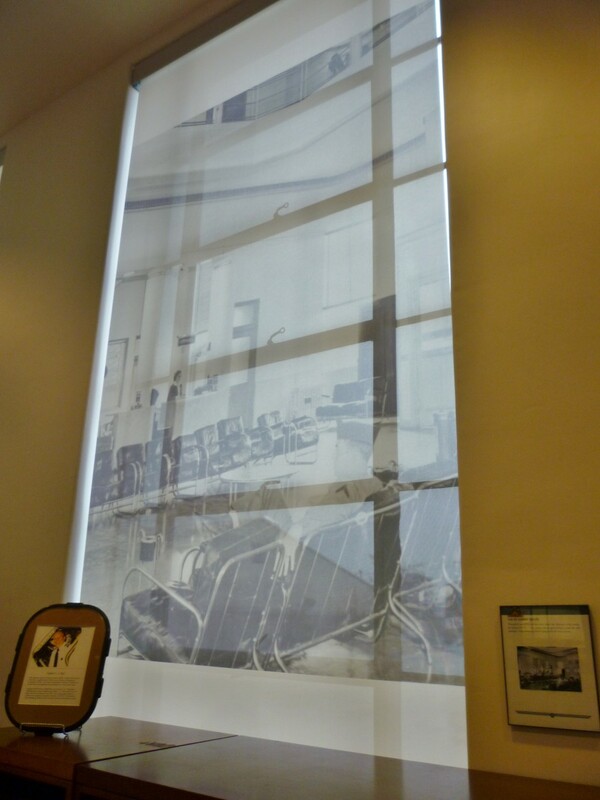 Aside from all the wonderful artifacts, the facility itself is worth looking at just for its Art Deco Style. Here in So Cal, we have similar Art Deco Style building at Long Beach Airport. 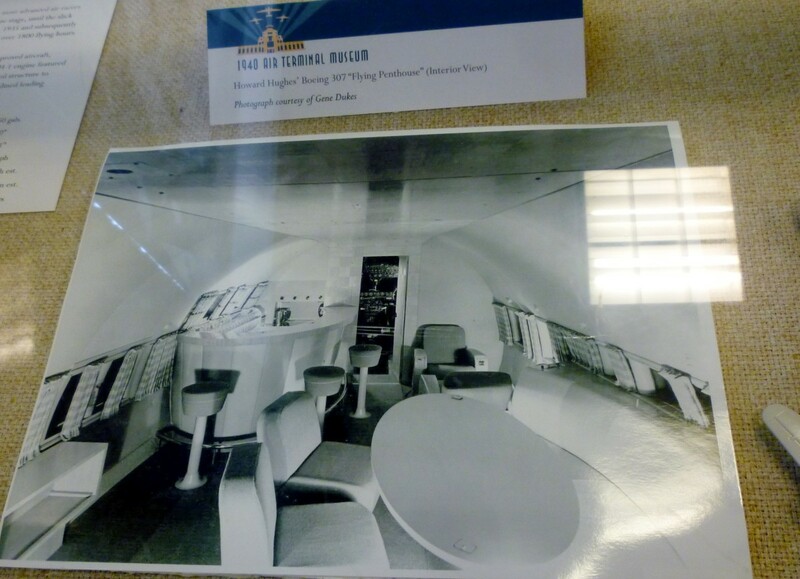 I'm afraid that the stylish era of airplane transport is all but gone except for those people who can afford first class or private airplane transportation. I am old enough to remember those bygone days. So glad you liked reading this. 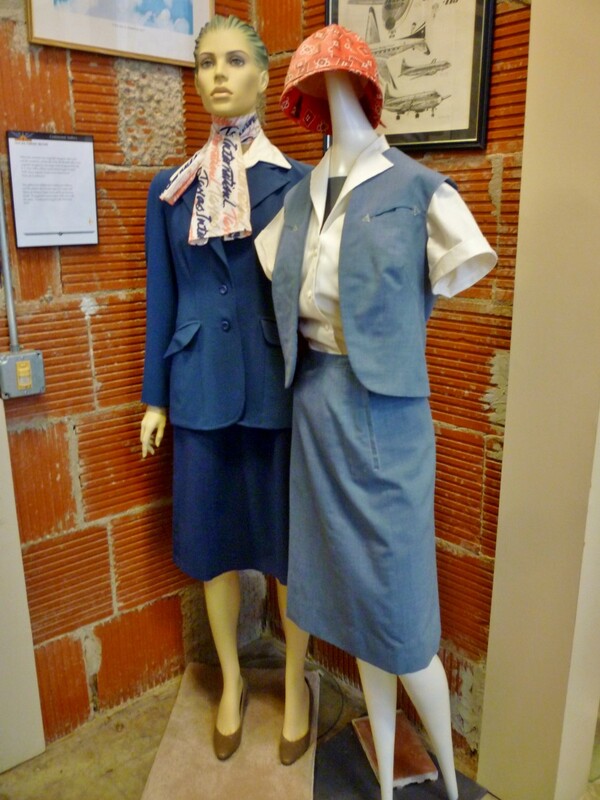 I also enjoyed viewing the uniforms that flight attendants used to wear. There were even more on display than the ones featured in this article. The museum is truly an interesting place to visit. We are having similar temperatures down here. Many more hot months are ahead of us! You always make these places look and sound so interesting! I found the photos of the uniforms from the 40s especially interesting. Tourist season is upon us and this really does sound like an interesting place to visit. We have had low/mid 90s here for the last few days and the forecast looks like the heat and humidity are here to stay -- at least until it gets even hotter! Stay well, and take care. Glad to know that you enjoyed my photos. Winning an airplane in a raffle is certainly exciting for pilots or those who intend to become a pilot. 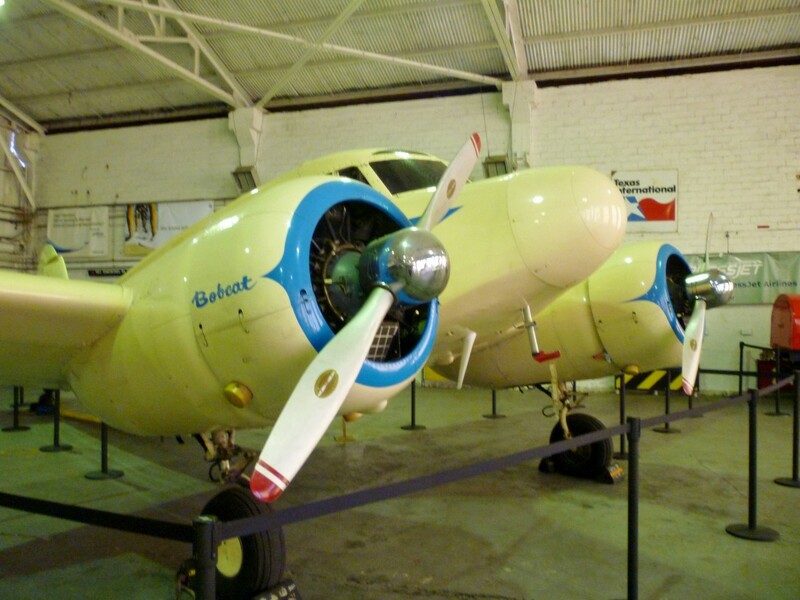 With your interest in airplanes I thought that you would like a virtual tour of this interesting Houston museum going back to earlier days of flight. This is an interesting article with some great photos. A raffle with an airplane as the prize sounds very enticing! Thanks for the virtual tour, Peggy. 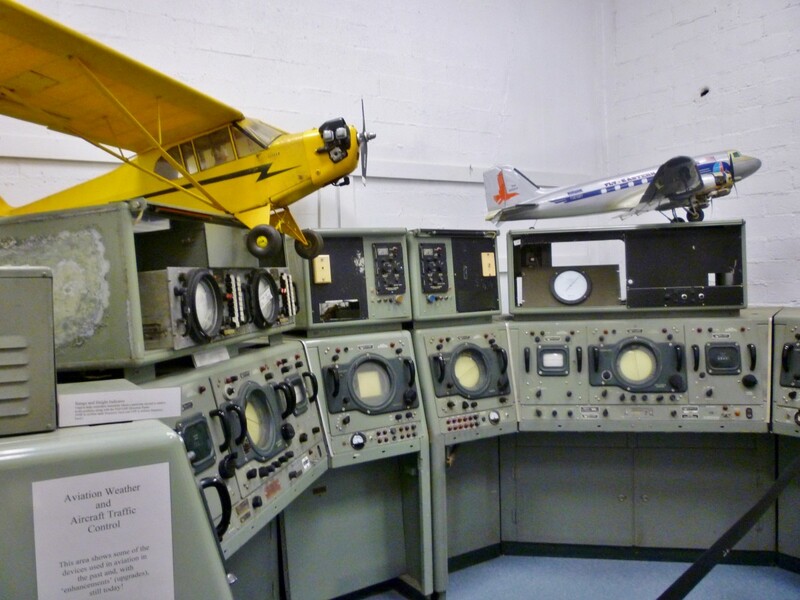 This is an excellent article about this museum that highlights civil aviation from its earliest days. Thank you for posting. Air travel has certainly changed a great deal from what it used to be like in the past. That is an understatement! I am glad that you liked my photos. I'd love to visit this one day. 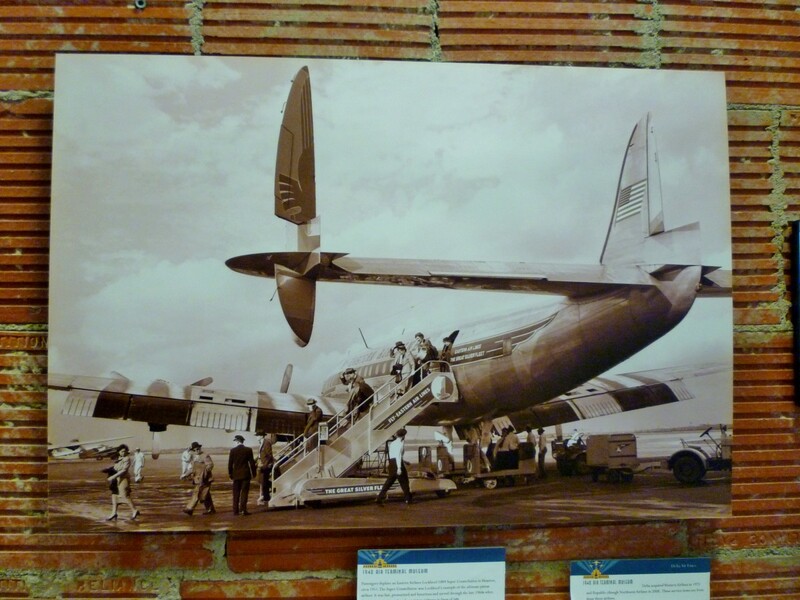 Air travel has changed so much and it's fun looking back at how it was. I think there would be something for everyone to enjoy there. Wonderful images. Good museums showcasing history are most often worth a visit and this one I found to be fascinating. Thanks for your comment. 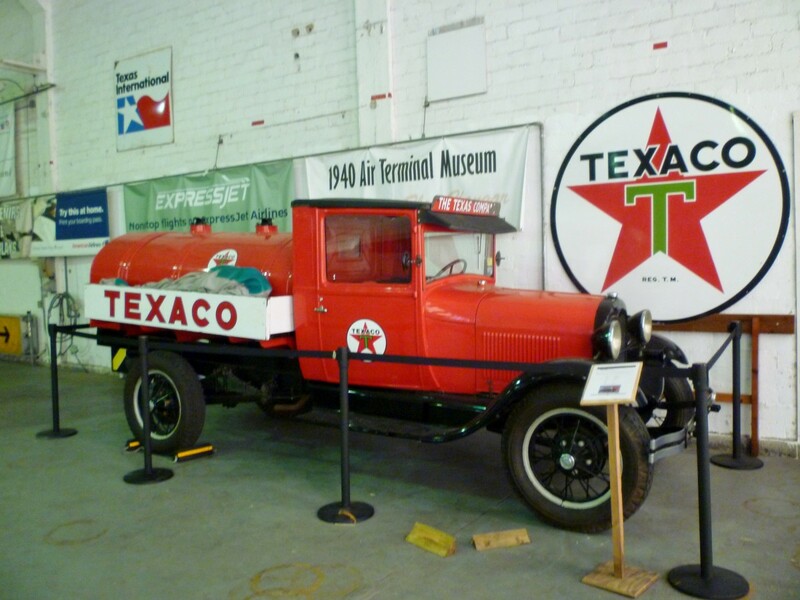 So happy to hear that you enjoyed this look at this historical museum in Houston. 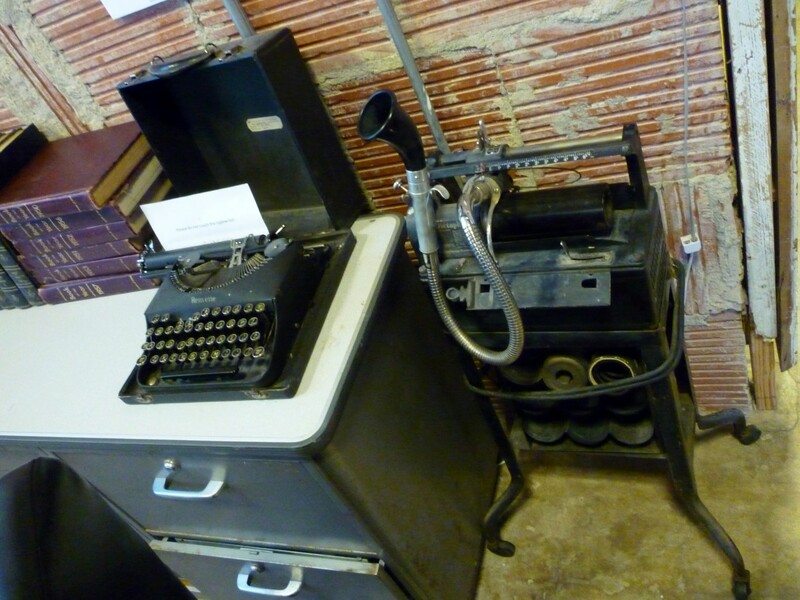 This is but a fraction of what you would see if you ever get to visit the 1940 Air Terminal Museum. Your nephew sounds like an interesting fellow! That is a beautiful painting of his particularly with the colorful sky. He did a great rendering of the 1940 Air Terminal Museum. 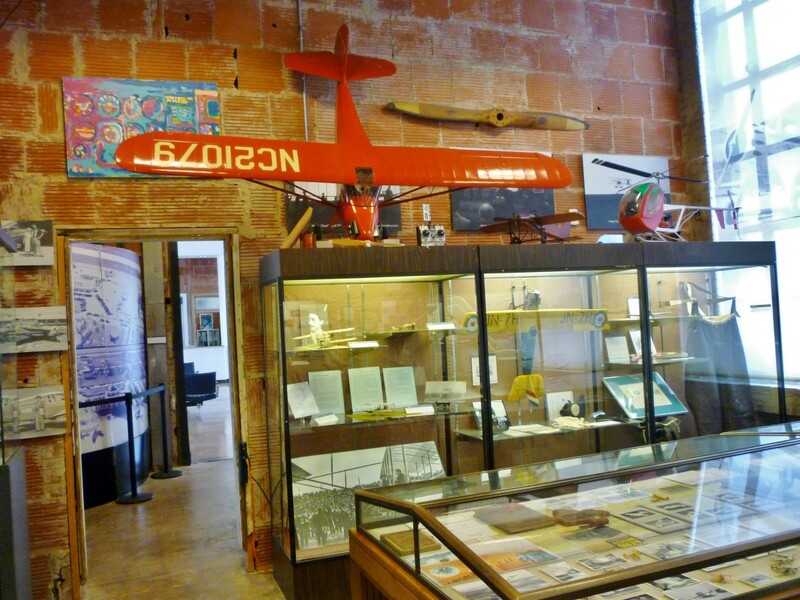 Some lucky person wins an airplane every year at the 1940 Air Terminal Museum here in Houston for the price of a ticket. That is a great fundraiser each year. 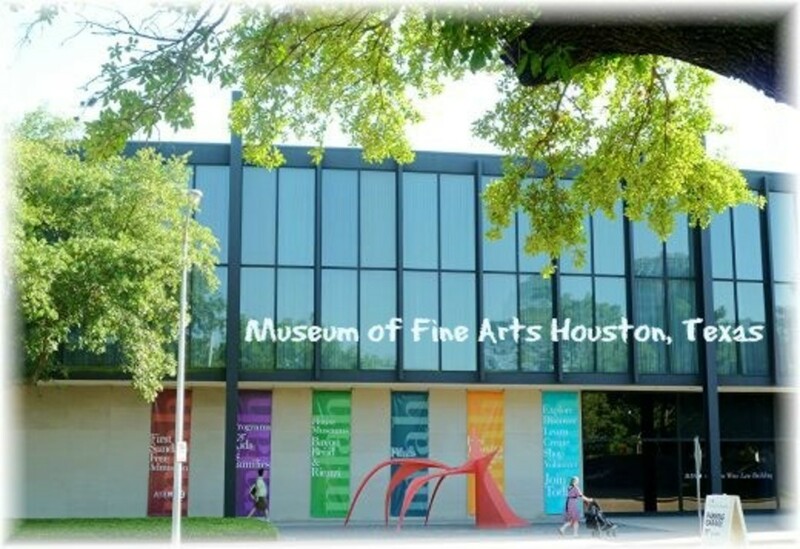 If you return to Houston this is one of many museum visits you might wish to make. Our city has many interesting ones! Thanks for your comment. 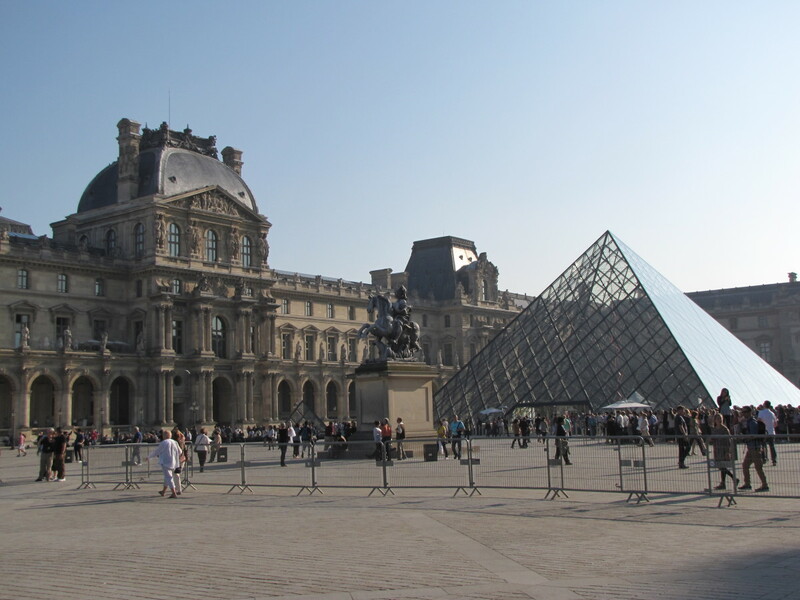 I'm not much for tourist attractions, but this one I would go to. I love history in all shapes. Thanks for the quick tour! This site shows a painting of his top right, Jonathan Frank. 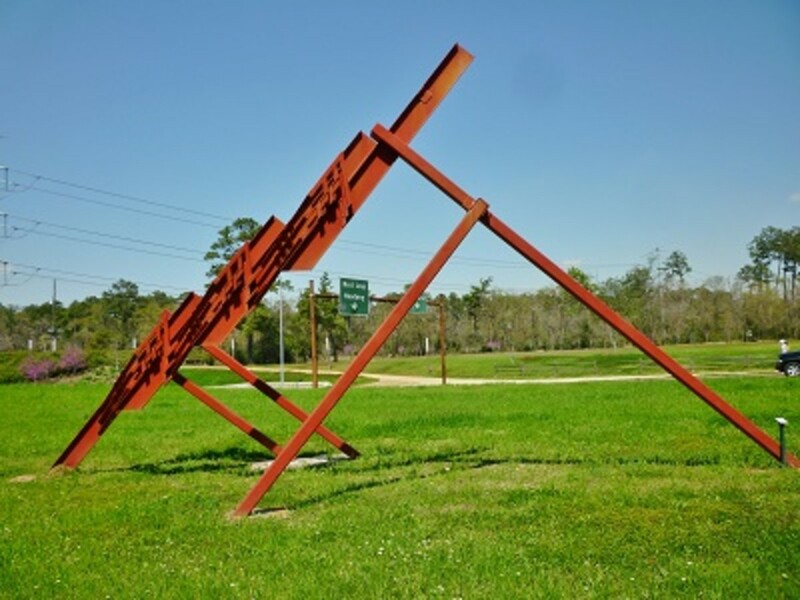 I have a nephew who is a Houstonian, a commercial pilot and an artist, and I think he has some art on display there. I will will send him a link to this. How interesting! I loved seeing the old memorabilia and the grandeur of bygone days. Would enjoy seeing it in person if I ever got the chance. Can you imagine lucking out and winning that raffle? I visited my friends in Houston two years ago but did not make it to this Museum. I now have another reason to visit.